All Vortex spotting scopes come complete with zoom eyepieces. 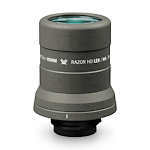 The eyepieces listed here are optional, special function accessories. For Razor scopes, Vortex has two eyepieces with ranging reticles and one with long eye relief. For the Viper series, they offer a fixed power, wide angle eyepiece.